The game library of SlotsMillion Casino is one of their strongest points. Read our review to see if everything else is as cool as their games are. SlotsMillion Casino is a good-looking website with a solid reputation. We were trying hard to find some strong drawbacks of this casino, but we didn’t find anything like that. The casino is operated by Alea Gaming Ltd. These guys definitely know what are they doing - during just 2 years of being in business, they managed to create a great casino, with a huge game library, promising bonuses, a functional mobile version of the website, and a wide choice of banking options. The casino holds not one, not even two, but three licenses: from the Government of Curacao, the UK Gambling Commission, and Malta Gaming Authority. They are also secured with the advanced SSL encryption, which won’t let any hackers to steal your personal or financial data. As we said, the game library is one of the strongest points of SlotsMillion Casino. 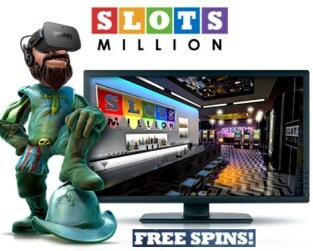 Not because they really offer a million of slots (which is a pity), but because they offer over 2000 different casino game titles from no fewer than 40 software providers. These include NetEnt, Microgaming, Play N’ Go, Thunderkick, NextGen, Playtech, and many others. It’s not so difficult to guess that slot games build up the main part of their game collection. However, table and video poker games are also widely represented here. Furthermore, they have around 40 games available in virtual reality. You can walk around their virtual casino and choose any game you like! Oh, they also have some live games from NetEnt, including Blackjack and Roulette. The only tiny drawback, highlighted by HMC in their SlotsMillion Casino review, is the limited support working hours: from 10:00 through 00:00. Anyway, you can get in touch with their agents via live chat, standard email option, and phone number. Also, if you are an active user of the social medias, then you will probably be happy to hear that you can follow the casino on Twitter and Facebook. The selection of banking options is wide. There are many popular and local withdrawal options at your disposal. These include Visa, MasterCard, Bank Wire, Skrill, Neteller, PaysafeCard, and others. Maybe, only PayPal is missing here. Nevertheless, their payout limit is rather low (€50,000 per month), and the withdrawals themselves are fast (around 24 hours). The Welcome Bonus at SlotsMillion Casino is not the biggest one in terms of its amount and match percentage, but it’s definitely fair and favorable. So, the casino welcomes you with a 100% match bonus up to €100 on your first deposit. You will also get up to 100 free spins (a set of 20 free spins each day during 5 days) on some selected games. The wagering requirements are not scary - 35x the bonus value. The same requirement applies to the free spins winnings. It’s high time to make a conclusion. Hm… does it really make sense to do it? That goes without even saying - SlotsMillion Casino is a great website, with thousands of games to choose from, convenient banking options, and promising bonuses. We just see no reasons to avoid this place.